The historic city of George Town is well known for its unique architecture and townscape, featuring residential and commercial buildings with influences from different colonial eras. George Town is often regarded as one of the most complicated World Heritage Sites to manage with more than 5,000 buildings almost equally distributed in the core and buffer zones. Among the types of buildings that can be found in George Town are shophouses, bungalows, mosques, churches, Chinese temples, Hindu temples, administration buildings, commerce and trade buildings, godowns and offices, water villages (clan jetties) and residential blocks. The buildings within the George Town UNESCO World Heritage Site are categorised into four categories encompassing both conservation and compatible development. The use of Category I buildings and sites should remain as originally intended, or be of similar use or nature of activity. Repairs carried out should use authentic, traditional ways of building methods and materials. Buildings, objects and sites of special interest that warrant every effort being made to preserve them. Existing empty land or temporary structure where compatible redevelopment is permitted. Existing building without any significant value where sensitive redevelopment is permitted. George Town World Heritage Incorporated supervises the restoration of buildings by monitoring the conservation works conducted within the George Town UNESCO World Heritage Site. Contractors must adhere to the guidelines in the George Town Special Area Plan which serves as the Conservation Management Plan to this heritage city. Regular site visits are conducted and inappropriate restoration works are reported to the City Council of Penang Island. The team of George Town World Heritage Incorporated also provides complimentary professional consultation services to owners and tenants of heritage buildings, as well as their contractors and consultants who intend to conduct repair, restoration or adaptation works on heritage buildings. 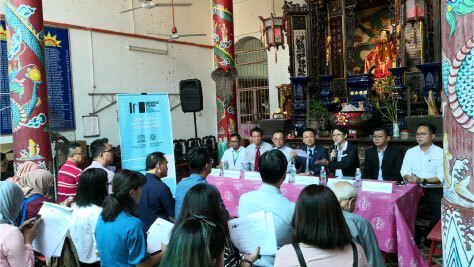 The consultations involve restoration of shophouses, conservation of Category I buildings and repair works on heritage and non-heritage properties in the George Town UNESCO World Heritage Site. Our team of experts will explain the appropriate materials and approaches for the restoration of heritage premises. George Town World Heritage Incorporated conducts comprehensive project management for the conservation and restoration of heritage premises within the inscribed Property, for example, Ng Fook Thong Cantonese Districts Association clan temple in Lebuh Chulia, Penang Goldsmith Association (Penang Ta Kam Hong) in Lebuh Muntri, and Penang Grocers’ Association in Jalan Pintal Tali. We also play a pivotal role in two panels – Technic eview Panel (TRP) and Public Arts Review Panel (PARP). The TRP was established to evaluate applications and proposed development projects in the George Town UNESCO World Heritage Site. Panel members consist of the City Secretary, the General Manager of George Town World Heritage Incorporated, architects, planners, engineers, non-governmental organisations, as well as independent consultants and experts. PARP comprises members who evaluate all mural related artworks within the World Heritage Site. We also attend Penang State Planning Committee meetings and City Council of Penang Island’s One Stop Centre meetings, held to review and make decisions on development policies and plans in the state. 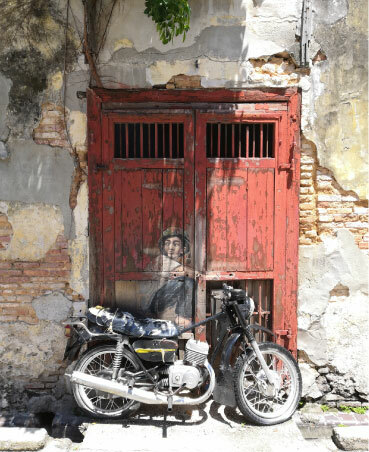 Heritage building owners who wish to restore and manage their premises within the George Town UNESCO World Heritage Site can contact Muhammad Hijas Sahari, Manager, Department of Built Environment and Monitoring at 04-261 6606 or e-mail hijas@gtwhi.com.my. Public art refers to art in any media that has been planned and executed with the intention of being staged in the physical public domain, usually outside and accessible to all. It may include any art form which is exhibited in a public space including publicly accessible buildings, walkways, parks and other spaces where public is accessible. The State Government of Penang has formed the Public Arts Review Panel to evaluate all mural related artworks within the World Heritage Site. Only murals deemed relevant will be approved and retained, and all others will be removed. Those who are interested to paint a mural or any public artwork in the George Town UNESCO World Heritage Site are required to submit an application to the Heritage Conservation Department in the City Council of Penang Island, or download the application form. George Town World Heritage Incorporated will coordinate the applications received, of which the Public Arts Review Panel will evaluate the applications, and reject those that may detract from the Outstanding Universal Values of George Town’s tangible and intangible heritage. For enquiries on public art, contact Noor Asyiqin Zainal Abidin, Senior Built Environment and Monitoring Officer at 04-261 6606 or e-mail asyiqin@gtwhi.com.my.